The second edition of the Antigua 360º Race will take place on February 17, 2017 providing a 52 mile anticlockwise circumnavigation of Antigua. Organized by the Superyacht Challenge committee, entry is exclusively reserved for boats entered in the 9th edition of the RORC Caribbean 600 offshore classic, which will start three days after the Antigua 360º. 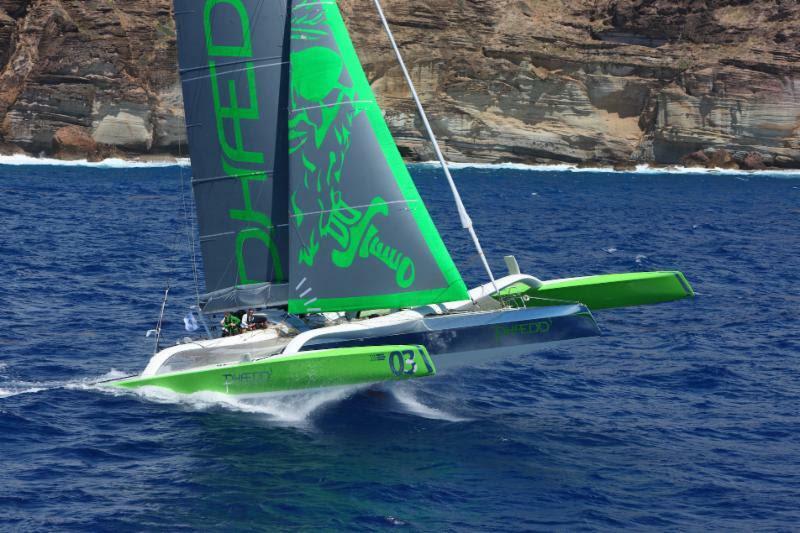 In last year's inaugural race, Lloyd Thornburg's American trimaran Phaedo3 set the race record for the multihulls (4 Hours 12 Mins 56 Secs). This year Phaedo3 is back and will be joined by Giovanni Soldini's Maserati, with two MOD70s on the race track, the relatively slow record set in 2016 is likely to be blown apart. The monohull course record was set last year by RP90, La Bete (5 Hours 00 Mins 26 Secs) and two early entries are very capable of lowering the bar. The 182ft twin-masted schooner, Adela and the 105ft sloop Danneskjold, are both expected to be on the start line for the Antigua 360º Race. During this year's Superyacht Challenge Antigua both of these magnificent yachts achieved speeds in excess of 17 knots, more than enough to secure the race record. Line Honours for both the Monohull and Multihull Classes will be awarded with a barrel of rum, with an additional barrel for a race record. The overall winner of the race, for yachts racing under IRC, will also receive a barrel suitably filled. 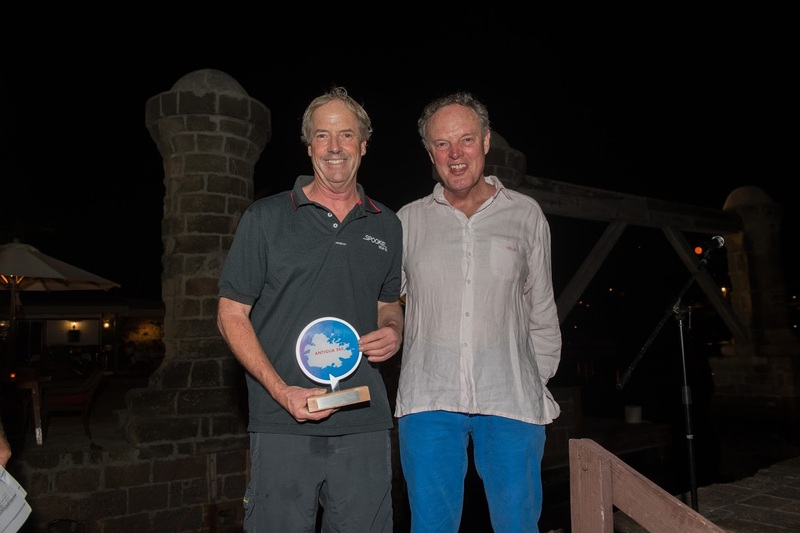 John Burnie's account of the first Antigua 360º Race from on board RP90, La Bete, which set a monohull race record for the Antigua 360º Race of 5 Hours 00 Mins 26 Secs for the 52 nautical mile course on 19th February 2016. 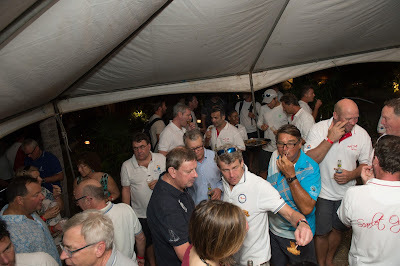 The Inaugural Antigua 360 Race started under sparkling skies and a moderate to light wind on Friday 21 February 2016. This race, conceived by Stan Pearson and a group of enthusiastic sailors involved in Antigua yachting events (notably the RORC Caribbean 600) has attracted considerable attention since its announcement. 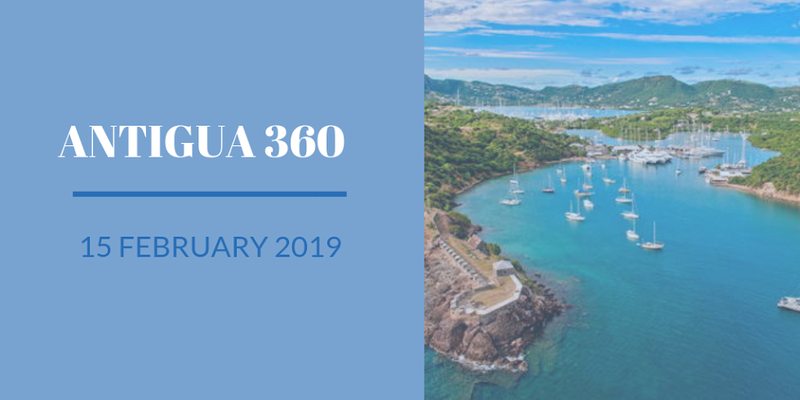 Designed as a true and meaningful practise day race before the main RORC event (and only open to qualified 600 entries) the Antigua 360 Race already looks to be a must do event for all future participants of the classic 600 mile offshore. The fleet were started under the watchful eyes of a talented race committee, headed by John Coveney and his team who officiate at other premium events like the Antigua Superyacht Challenge. It was decided to send the fleet off in time staggered starts with the lowest rated boats starting first - the theory for this is that the smaller yachts then finish around the same time as the bigger boats plus the enjoy some fleet engagement towards the end of the race (rather than sailing a course on their own). I was sailing on LA BETE (ex Rambler 90) for the event and, being a bigger rated boat (second largest handicap in the RORC fleet), we approached the start line some time after the lower rated boats had already started racing. We could see SPOOKIE with the indefatigable Steve Benjamin already in a tight tussle with TONNERRE as they beat up towards Green Island. 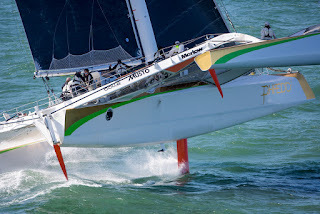 Our eyes however were firmly fixed on JETHOU a Maxi 72 who would be our serious competition for the day. Owned by seasoned campaigner and helm Sir Peter Ogden, and with a cast of star sailing talent on board including Brad Butterworth, we knew the futuristic looking black sailing yacht would be our competition for the day. In addition this was the first competitive outing for FARFALLA a Southern Wind 102 skippered by Richard Chadburn. They had shipped in a strong group of professional sailors including Steve Hayles and again we knew we would have to keep an eye on them holding us on rating terms. Also on the start line was NIKATA, a powerful new Baltic 115 skippered by Matt Hardy and his talented team of sailors. Mike Broughton was navigating, a regular Caribbean 600 participant, and I was interested to see how his tactical game played out. We expected them to be competitive. Last to start would be Lloyd Thornberg's PHAEDO, a MOD 70 trimaran skippered by Brian Thompson and his multi - record holding team. We all hoped to beat them on the water if we could - even though they were handicapped on their start time. The marvellous thing about the Antigua 360 Race is that the course provides the exact conditions teams need to address when racing in the 600 mile race. The start is on the same line giving boats an opportunity to practise starting in the shifty areas under the pillars of Hercules. The beat to Man o War Point is part of both courses followed by some good reaching legs and a good VMG downwind leg with plenty of tactical gybing possibilities all of which are much part of the main race as well. Then there is even a tricky transition zone to negotiate near Sandy Island which is really good practise for the infamous area off Guadeloupe. This is followed by a solid beat which is part of the last leg back from Redonda in the the 600. Again this is an ideal opportunity to practise in the shift areas off the coast of Antigua as boats approach the finish line (the same in both events) finally finishing on the line off Fort Charlotte. This was our first competitive outing on LA BETE and we placed ourselves moderately at the start anxious not to be over the line. JETHOU had the better of us as did NIKATA with FARFALLA just behind. The wind (as it would remain for much of the offshore) was unusually right biased with more south in it than is the norm. This meant that very quickly the first beat became a fetch and then a reach. JETHOU carried high and was first to deploy a GS staysail - we followed suit. On LA BETE we carried a low line on Willoughby Bay causing consternation to some navigators on other yachts - our draft is deep but we had sailed this exact line in days before practising - so we were very confident of our track. We gained by sailing less distance here. We rounded Man o War in very close company with JETHOU just behind and NIKATA powering through above. Sadly at this point NIKATA was forced to retire due to technical problems denying us the opportunity to see her at her best. After a short reach those on JETHOU and our foredeck team raced to be first to hoist our kites - A2's in view of the southerly aspect to the breeze. Looking up the course earlier I had the impression the smaller boats had passed this area in more pressure as both JETHOU and our team were now squeezing everything we could out of the 10-12 knot breeze. JETHOU gybed inshore looking for pressure but we held on and were lucky to find slightly more wind offshore. As we crossed on gybes we could see a small but definite advantage, being in more wind and having a longer waterline length. The sail down the west side of Antigua was magnificent with sparkling seas and dolphins playing off our bow. Approaching the end of the leg we were looking ahead to which sail to change to after round the reefs off Dickenson Bay. There is alway an acceleration zone here and the wind piped up to 20 kts keeping everyone on their toes as the yacht accelerated over the 20kt barrier. This is a very tactical part of the race as the gybe angle into Sandy has to be calculated carefully as the wind shifts dramatically and suddenly you are into a transition zone. This area varies according to wind direction and strengths making it an interesting challenge for all. We opted for a gybe on to the fractional code zero as that would give us options to furl easily at we ran into changing conditions. JETHOU and FARFALLA both chose sails wisely and made good gains on us in the feisty reach after the gybe. Suddenly we were were in the fickle wind off Sandy Island and we stalled as the light air seemed to come from every direction. JETHOU was in a very good line above and closed the gap rapidly as we floundered in the hole - and then she too was in the lighter air her crew working hard to take down sails and put up headsails. All three of us now we're in very close company looking for a way through to the new breeze. This was the critical turning point of the whole race - on LA BETE we read the winds well and somehow wriggled our way toward the gradient breeze quickly filling in by the island. JETHOU inexplicably tacked offshore towards the hole and buried themselves deeper never to recover. Due to our rapid transition and exit we left the area quickly upwind and saw the following yachts get overwhelmed by the windless area that seemed to grow larger every minute. Luck? Yes - but we chose our course we'll always looking to exit the hole left inshore was the key. Steve Benjamin, TP52 Spookie collecting the overall winners trophy from RORC Commodore, Michael Boyd. The beat across the flat blue waters off Jolly Harbour towards Cades Reef is probably one of the finest sailing areas on the planet - truly spectacular water conditions and one of the best places for yachts to look at VMG efficiency upwind and analyse their instrument data. Quickly we were into the beat after Cades Reef on the true wind gradient and we made the usual tactical choices under the cliffs on Antigua as we made our way up towards the finish. In front we were picking off some of the early starters and we could see the trimaran snapping at our heels from behind but not quite catching us before the line. Finishing in close company with the rest of the fleet we were pleased in our first race to achieve first in our class and best elapsed monohull. Congratulations to Steve Benjamin and the SPOOKIE team who won their class and achieved the best corrected time by quite some margin. This is truly an great race - and like the RORC Caribbean 600 it will become a classic of its type. It is without doubt the best preparation you could have before the main offshore event - crews should seriously consider it as part of their 600 training a matter of course. Boats and crews are gathering in Antigua in anticipation of The Inaugural Antigua 360 Race which takes place on Friday 19th February. This new and exciting race was conceived by Stan Pearson, a co-founder of the RORC Caribbean 600. Entry to the Around Antigua 360 is exclusively reserved for boats entered in the RORC 600 mile offshore classic, starting on Monday 22 February. "Many boats are usually out training on the Friday before the Offshore race" quotes Stan, "So it is a logical process to add a slightly competitive edge to that training. Racing around the island boats will experience many of the conditions and wind angles seen on the offshore course - and some of the legs are even actually part of the 600 - particularly the start and the finish approaches to the line - the lines used are exactly the same as the 600. 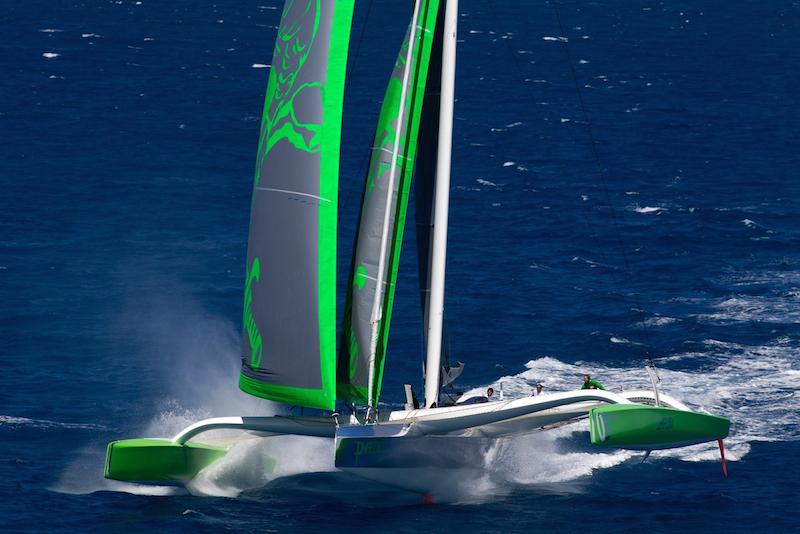 In fact last year two multihulls, Paradox and Phaedo (the current 600 record holder) both went around Antigua as part of their 600 training and both found it highly useful in their build up to the offshore event." This year the 8th edition of the RORC Caribbean 600 has an entry list as glamorous as any Grand Prix event anywhere. World class teams are already gathering in Antigua and the buzz around the dock is as much to do with the Antigua 360 Race as much as the offshore event. Entry interest has been given by the following boats already in Antigua: Phaedo3, Jethou, Momo, Tonnerre, Spookie, La Bete, Nikata, Farfalla, Guardian Angel, Belladonna, Spitfire, Mussulo 40, Taz. Unusually for an event of this calibre there is NO ENTRY FEE! The event is being managed and run by Stan Pearson and his SYCA team who run the annual Superyacht event in Antigua every January. 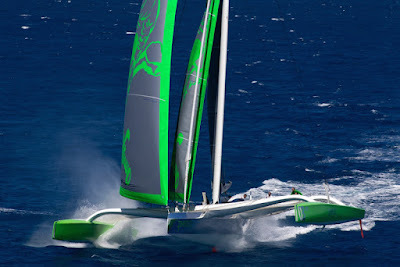 Two of the entries Momo and Jethou are hot Maxi 72 yachts from the international circuit and the record breaking MOD 70 multihull Phaedo will be out in earnest to set the 360 Round Antigua multihull record. Having just lost out to Ned Collier's MOD 70 Concise 10 in Barbados may see the gauntlet thrown down between these two boats again on Friday. La Bete (ex-Ramber 90), and two new boats over 100ft Nikata and Farfalla will be vying for the mono hull prize, while hot IRC racers like Spookie and Tonnerre will be pacing themselves in handicap mode. Inevitably Bernie Evan - Wong (local resident and participant in every 600 race) has already entered his latest boat Taz in the 360. Bernie is a serial supporter of such events throughout the Caribbean!! Guardian Angel is a well campaigned and competitive Oyster which is expected to do well in handicap - but they will be hotly pursued by RORC Admiral Andrew McIrvine and RORC Commodore Michael Boyd who have entered the Round Antigua 360 on Belladonna, chartered by them and their usual RORC team for the offshore race as well. A top race committee is in place to manage this new event and the NOR and SI's are both online. Registration is now open at the SYCA office in Nelsons Dockyard (next to Immigration) and the skippers briefing will take place at 18.00 in the Admirals Inn followed by cocktails. The Prize Giving will be at 18.30 after racing, again in the Admirals Inn, with trophies awarded for: 1st Corrected IRC Overall. 1st Elapsed Monohull. 1st Elapsed Multihull. This is undoubtedly the new race to watch if you are not already participating.